When you go for surgery, the first thing you want is a qualified surgeon: a qualified surgeon increases the chance for your success. Surgeo's exclusive surgeon network allows only surgeons who have been qualified with our specific form of peer credentialing, as described below. Our surgeon qualification process includes steps that work to bring you surgeons who are accomplished, skilled, and thoughtful. Surgeo surgeons are the surgeons that other surgeons go to when they need surgery. What about a surgeon tells you that he or she is the right choice? Two qualities that relate most to good surgical outcomes are focus – clinical specialization – and actual experience. So while one might want a surgeon who has published a lot or lives down the street, the fact is that little seems more correlated to good outcomes than focus and experience. 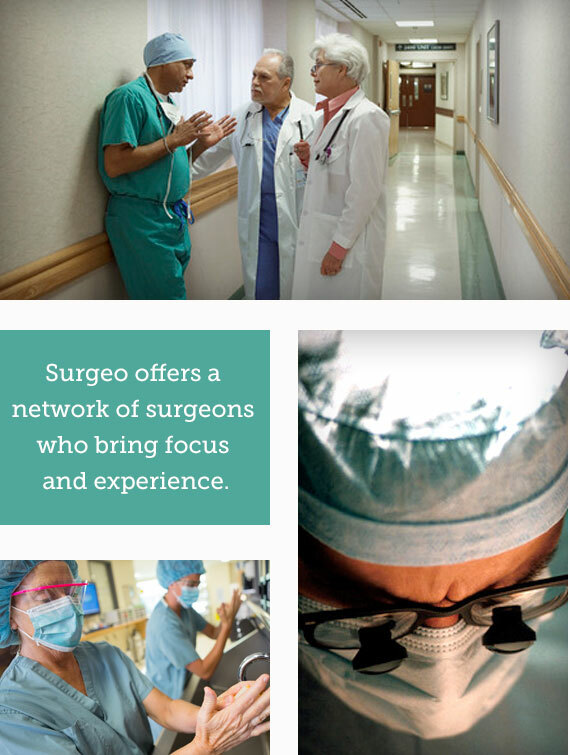 Surgeo offers a network of surgeons who bring focus and experience. Patients who need knee replacement have choices of surgeons who specialize in knee replacement. Patients who need hysterectomy have choices of surgeons who specialize in hysterectomy. Patients have choices based on surgeon focus and experience. To build a network of surgeons who bring focus and experience, we collect information from the surgeon about such basic information as education, specialty training, and years doing the specific procedure under discussion. We also collect information from malpractice registries, state medical licensing agencies, and peer references, which may include other surgeons, anaesthesiologists, operating room directors, and others. We ask patients about surgeons and examine online reputations. We listen hard. If a surgeon tells us that there is no risk with his or her surgeries, we move on because there is no such thing as surgery without risk. If a surgical nurse manager won’t tell us how the surgeon behaves with patients, we move on, because silence speaks volumes. We want you to have a surgeon who is focused, experienced ... and approachable. To become a surgeon within the Surgeo network, a surgeon must have a Medical Doctor (MD) or Doctor of Osteopathy (DO) degree, a license to practice medicine, specialty training, and experience doing the procedure under discussion. Surgeo surgeons typically have at least 10 years of specialized experience and, in some cases, more than 30 years. Surgeo employs a surgeon qualification system based upon subjective peer credentialing. This means that every applicant surgeon has to submit the names of other surgeons, anesthesiologists, and others who have worked with him in the operating room, hospital wards, and so on. Surgeo privately asks those references and others about the applicant's technical skills: how he makes a skin incision, blood loss, judgment, and so on. Surgeo also asks about bedside manner: punctuality, patience, and so on. There are reasons to believe that peer credentialing may be the closest way we can today assess individual surgeon ability. Learn more about our approach to surgeon qualification with peer credentialing by clicking here and here. Confidential peer input is not the only credential Surgeo checks. This is partly because a surgeon's peers may not know everything about him. For example, a surgeon who has seen another operate may be very respectful of his abilities but know absolutely nothing about the frequency of serious complications. Likewise, a peer surgeon may know nothing about his behavior with patients or the fact that he has plagiarized and been held to account by a medical board. We do what we do to increase the likelihood that the surgeon you choose will smoothly and effectively deliver the outcome you want. We present you with information and invite you to study, compare, and add your own research, and encourage you to ask questions as you consider your choices. We will continue to take the steps necessary to offer you choices of surgeons who bring focus and experience. This is your surgery. This is your choice. The choice is yours. Get Started!